Upon arrival at Ferenc Liszt Airport, a low-ceiling arrival hall that, quite honestly, was unimpressive at best greeted me. The outside was also unimpressive: a spattering of industrial buildings here and there, fields of nothing, and a small, almost cramped, 4-lane highway going into the city. I hail a taxi and I start making my way into the city center. As we leave the airport, we pass more fields of nothing, more industrial buildings, and abandoned soviet-era apartment blocs. Where was the “most beautiful city in Europe” that I was promised? But Budapest rewards the patient. As we enter the city, its beauty unfolds one block at a time, and soon enough, my periphery is filled with rows upon rows of Baroque monuments, Renaissance-style buildings, Art Noveau structures, and various architectural styles. By the time we cross the world-famous chain bridge, I am in absolute awe of what I’m seeing. I ask the driver to stop in the middle of the bridge, he looks at me like I’m insane, and why wouldn’t he: it’s the middle of winter and I’m asking him to drop me off in a cold and windy spot on a bridge, but I just couldn’t help myself. The chain bridge, or the Széchenyi Bridge, is a marvel in itself (more on this later), but the view it offers pedestrians is breathtaking: to my right, I have a commanding view of the Parliament building, a gothic-style government building that looks more like a fantasy castle than a house for politicians. I spend a good 20 minutes just taking random photos of the Danube River and the Budapest skyline. Soon enough, however, the cold gets to me and I start to trudge towards my hostel. I booked a hostel in the Castle district, a beautiful segment of the city filled with medieval houses and cobblestone streets. 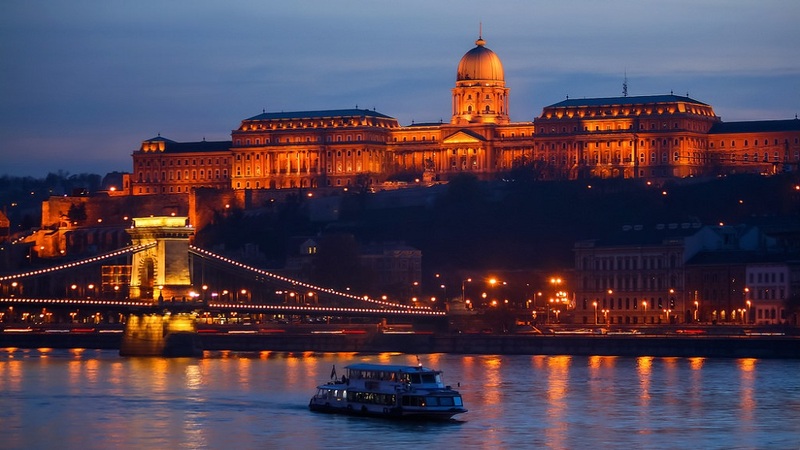 The entire district lies at the foot of Buda Castle, a massive Baroque palace complex that once housed the Kings of Hungary and the Habsburg rulers. I promised to tour this tomorrow, but for now, I must check in. I book a few nights at the Hilton Budapest, which was constructed to look like a 16th century castle in keeping with the design of its surroundings. After a speedy check in with the friendly receptionists, and a quick shower in my room, I set out to explore the streets of Budapest. I walk around for a good hour, my neck straining to see every detail of the buildings. Now I understand why Budapest is considered to be one of the most beautiful cities in Europe: every single I passed was designed to inspire awe and wonder. I loved the small details that they put in the façade of buildings, from faces of mythical figures like angels and Greek gods to neo-classical pillars and arches. I tried my best to get a photo of every building, but I realized that it would be folly: there’s not enough space on my memory card for all the buildings! I resigned myself to taking mental photographs instead (the best kind, if I might add) as I walked around. Soon enough, I find myself at the corner of a street called Frankel Leo and Török, in front of a shop called Nagyi Kifőzdéje (Grandma’s Eatery, according to Google Translate). I peeked in and was intrigued by the décor: white lace tablecloths, framed floral cross-stitch designs, phones from the 80’s. 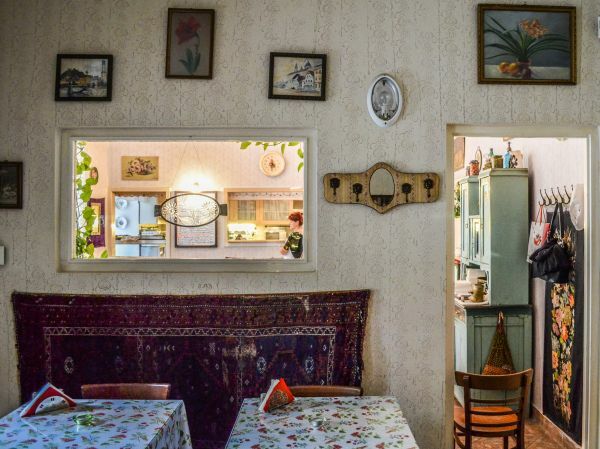 It’s basically what you might imagine a grandmother’s house would look like. With my tummy grumbling and my feet a bit tired from the walking, I walk in. The interior is warmer than I expected, a welcome fact, considering that it had just started snowing outside. Very good timing, I thought. It was 3pm and the place was quiet, with myself as the only customer. I find myself a seat and take a look at the menu. A mild panic sets in, but I calm myself down and let my adventurer spirit take over. Hey, the worst that could happen is I get a dish I don’t like, there are worst things on earth! Luckily, a kindly old woman comes out from the kitchen. She gives me a warm smile and greets me in Hungarian. I smile back and ask, do you speak English? The old lady gives me a sheepish smile and shakes her head. Oh well, I guess it’s going to be a guessing game! But the old lady must have sensed my hesitation. 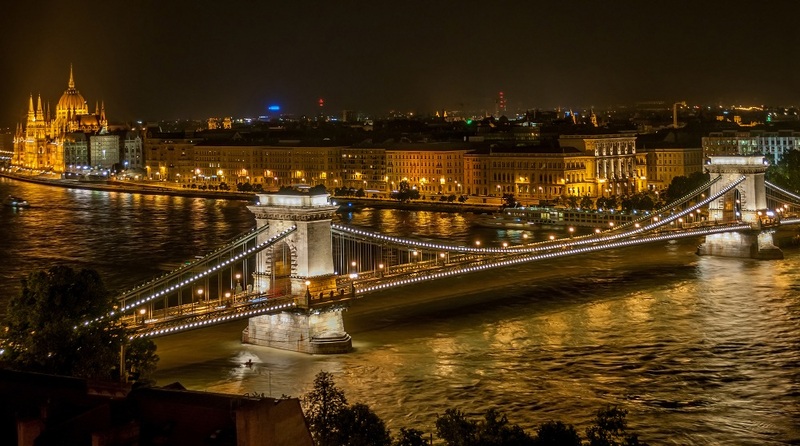 She waves her hand and speaks in rapid Hungarian. She takes the menu from me and tries to tell me to wait. At least, that’s what I think she was doing. She disappears back into the kitchen, speaking again in rapid Hungarian. I’m a little weirded out by this, but the entire time I’ve been here, I’ve felt nothing but welcome. I take this time to take in my surroundings: on my left is the window to the street. The building where the restaurant is sits across a 19th century apartment building with beautiful stone arches. Crossing the street between us, Budapest’s tram no.19 passes through. 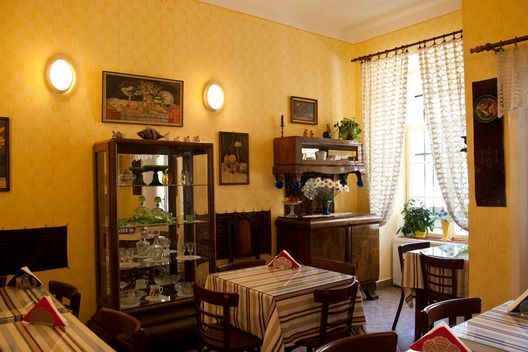 On my right, across three tables, is a wall filled with flower cross-stitch, black and white photos of old Hungary, a rotary telephone, and more flowers. The place was quiet, warm, quaint, and soon enough, filled with wonderful smells from the kitchen. Not two seconds after this amazing aroma hits my nostrils, and the old lady comes back clutching a tray of food. She puts the food down in front of me, and I’m amazed by the colors: a basket of still-steaming brown bread, a bowl of the most magnificent red soup I’ve ever seen, and a plate of what-I-assume-to-be cabbage rolls. The old lady takes out a calculator and types in numbers, my bill. I’m told the whole thing costs 1,500 Hungarian Forint, roughly $5. I’m stunned. They said Budapest was cheap, but I didn’t think I was going to get this much bang for my buck. “Gulyásleves! Good good! You eat!” the old lady says, and I was happy to oblige. I take my spoon and take a sip of the broth, and wow.